Arslan Senki (The Heroic Legend of Arslan) has a long history, reaching back to 1986 with the original fantasy novel by Yoshiki Tanaka. Recently in 2013, it received a new manga adaptation with Hiromu Arakawa, of Fullmetal Alchemist fame, doing the illustrations. This anime is based on this new manga, introducing the story to a modern audience, and retelling the sweeping epic of a prince who fights to reclaim his nation. The shining point of the show is Prince Arslan himself. With a rich amount of mythos to draw from, Arslan Senki does an admirable job trying to present as many aspects of its setting as possible. However, this also stretches the anime too thin at many points, with shallow characters and a narrow lens of the adventure. 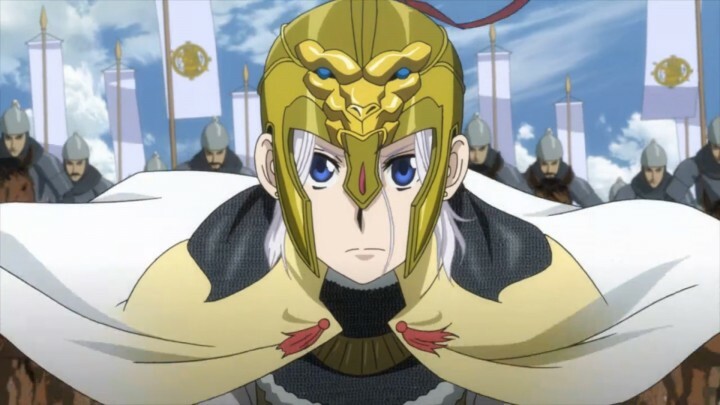 The shining point of the show though is Prince Arslan himself, who is a very likable main protagonist; he has a well-developed journey of personal growth and is consistently firm on his beliefs, yet not overly idealistic. He can take care of himself in battle and politics, but also trusts his companions completely to assist him. Trekking through the nation of Pars through his eyes, Arslan Senki ends up as a decent adventure whose grand scale is only just beginning. Arslan Senki starts off by establishing that Arslan is a kind-hearted, yet naive young prince of Pars. 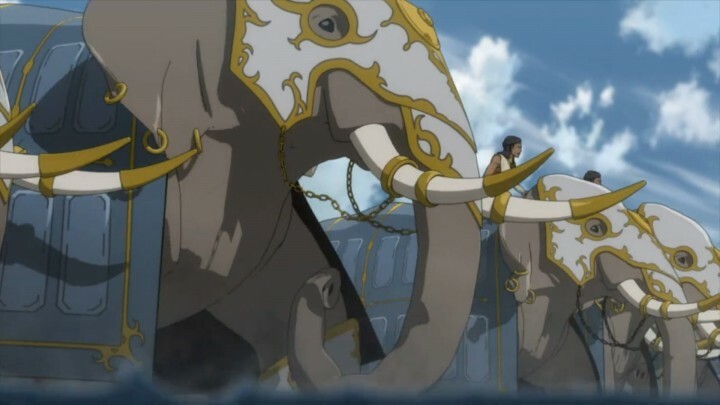 Immediately in the first episode, young Arslan is kidnapped by an escaped prisoner, a young child from the neighboring country of Lusitania. 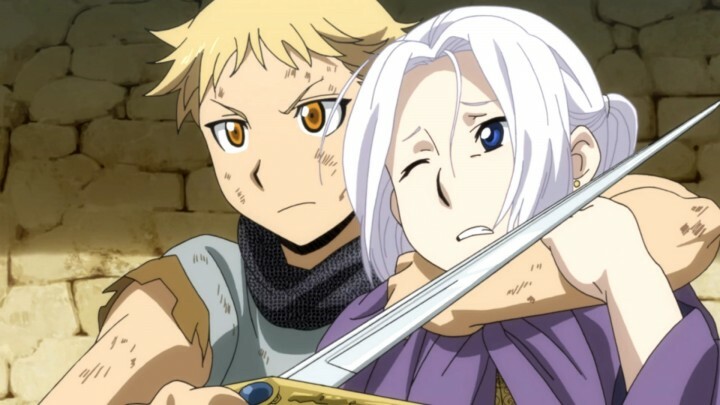 Through this brief hostage situation, Arslan is exposed to a different perspective of the world, hearing from the young escapee about how all men are equal in his country and slavery is nonexistent. Of course, they’re also a zealous warrior nation that kills non-believers including children and babies. But at least this comment about an alternate society gets Arslan to rethink the slave system that dominates Pars, which he always deemed as helping the slaves with food and shelter without seeing the cruel realities. For now, it’s not more than a passing thought for Arslan, who’s sheltered from the wars and politics around him. But it’s a very important seed that grows with him as he matures into a teenager. Everything changes 3 years later during Arslan’s maiden battle. An advantageous battleground is quickly turned into a death zone, with traitors helping Lusitania to lay traps and cripple the Pars army. The scale of the battle is impressive, with visibly thousands of soldiers clashing weapons amidst a vast landscape — although it feels a little low budget with some awkward CG animations. 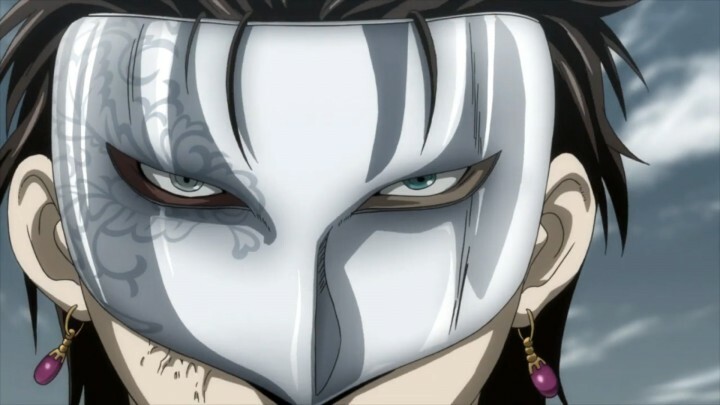 Eventually a man called Silver Mask reveals himself, one of the masterminds behind this battle. He seems menacing enough to be a primary antagonist, but for now he doesn’t do much except boil with rage. 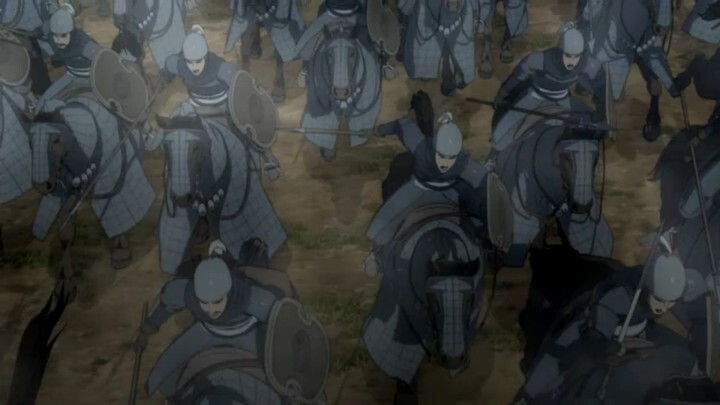 In the meantime, Arslan and his loyal friend Daryun are separated from the rest of the army in the commotion. With few options, they seek out Daryun’s friend Narsus, a brilliant former court strategist, for help. Narsus instantly gives off a vibe that’s quite similar to Zhuge Liang from the Three Kingdoms, hermit eccentricities and all. 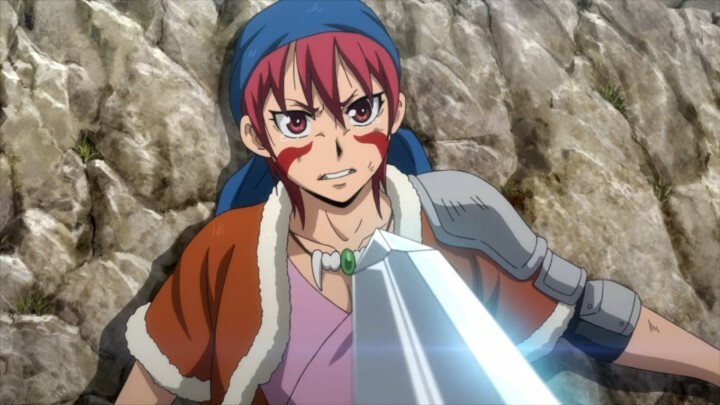 With him on the team, there’s some anticipation for clever battle tactics in the war to come as Arslan takes back his country, and their adventure takes the first steps here. While this early setup seems like it promises some grand battles and political games, the pacing is a bit slow and there’s not much character development; we’re introduced to a barrage of faces and names within a few minutes, some of which end up dying not long into the first few episodes. We’re also not presented with enough background on the warring nations to really feel invested in the conflict. Choppy animation and bad CG in the large scale battles detract from the anime a little as well. 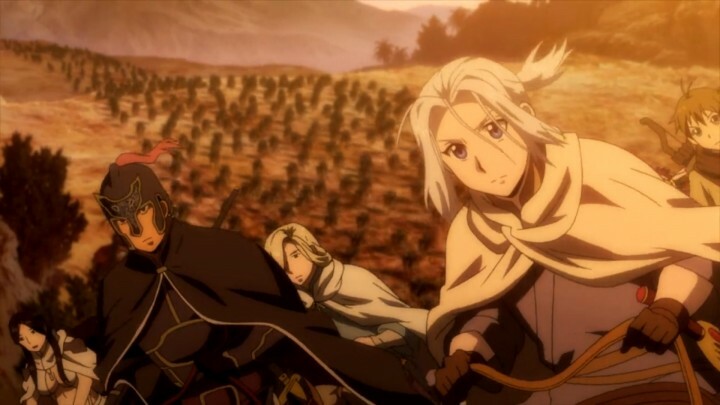 However, it’s clear that Arslan Senki is just gathering its many pieces to hopefully construct something impressive, and that’s good enough of a hook to keep watching. 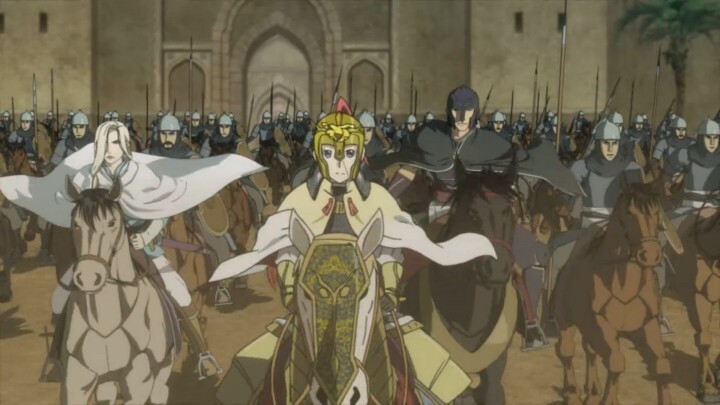 Arslan Senki gets more exciting as Ecbatana, the capital of Pars, is attacked from two fronts at once: by the Lusitanian army laying siege from outside, and by an incited slave revolution from within the city walls. The scale of battle is even larger this time, with dozens of trebuchets, mobile archery platforms, and thousands of infantry. How the Parsians handle the internal civil unrest adds a much more interesting layer to the conflict, as it’s no longer simply about military might; it provides a much-welcomed insight into the culture of Pars, and the contrasting ideologies of its own people as it concerns human rights. On that same note, we also get a better look at Lusitanian culture, using their God as the divine justification for their own corrupt and hypocritical actions. They don’t seem to value the slaves’ lives any more than the Parsians, yet they continue to proclaim that “all men are equal.” Behind them, Silver Mask is definitely pulling political strings as a master puppeteer, but to what end is still a mystery besides the fact that he has a hatred of Pars. The cast also gets larger with a couple of new additions. There’s the womanizing traveling musician Gieve, who has an air of mystery surrounding his playful demeanor. Coming from afar is the beautiful priestess Farangis, who’s exceptionally skilled with a bow. Both of them join Arlan’s crack squad for their own reasons, and help to pull off guerrilla tactics to chip away at the enemy’s forces, courtesy of Narsus’ meticulous planning and infiltration. The political games are getting more intriguing by the episode. 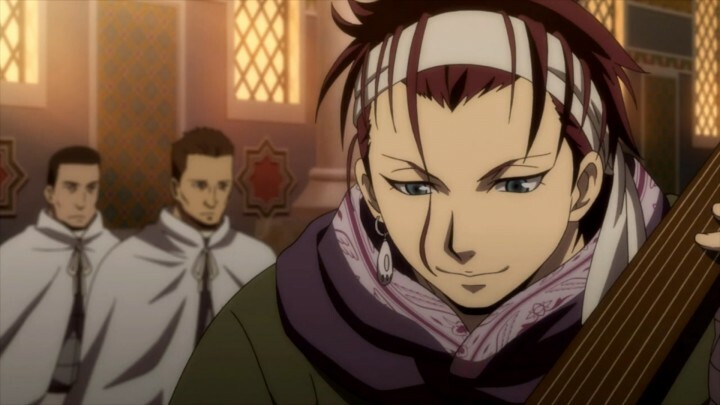 However, even with two unique characters in the mix, Arslan’s little band doesn’t have much depth. Their designs are definitely full of visual appeal, but we still don’t really know any of them. But, while I was disappointed with the continued lack of character development, the unfolding political games are getting more intriguing by the episode. 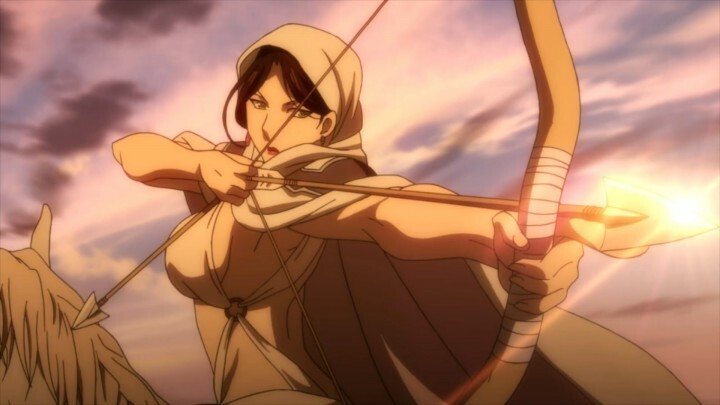 I enjoyed getting more insights into each country’s inner workings, and knowing what fuels their fighting makes me connect more with Arslan’s own ambitions too. As Arslan’s company heads towards Peshawar to recruit more allies, Arslan gains more valuable perspective that helps him grow as a leader. He observes how some slaves are still loyal to their masters even after being freed, and how his own countrymen can turn against him if they dislike his goals for reforming Pars. Narsus has been a constant mentor for him as well, providing lessons in strategy and morality. 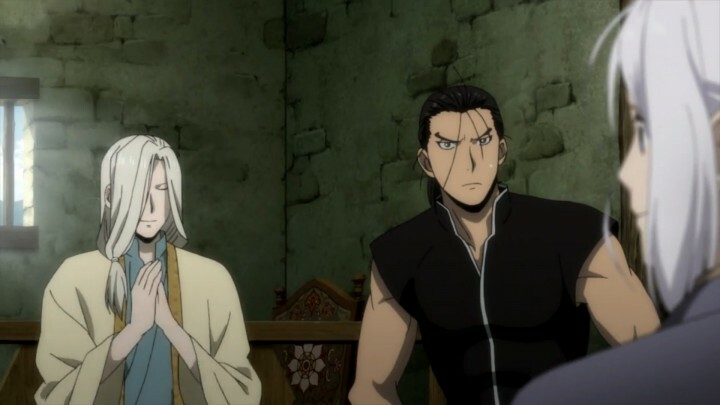 It’s nice to see Arslan already start to break away from his naivete and not stubbornly hold onto a single belief — a trait that some anime protagonists never lose. There are also some small glimpses into the personal stakes of the cast, which has been lacking so far; mostly it’s been the political and societal struggles that have taken center stage. We learn of Silver Mask’s true identity, and how his connection to Pars’ royal history fuels his ambitions. Another new character, the Zott tribe bandit Alfreed, joins up with Arslan to seek revenge against Silver Mask for what he did to her clan. A few other minor characters also discuss their loyalties and inner convictions. Their motivations aren’t particularly creative, but at least it’s a change of pace to have some plot momentum coming from the characters themselves. 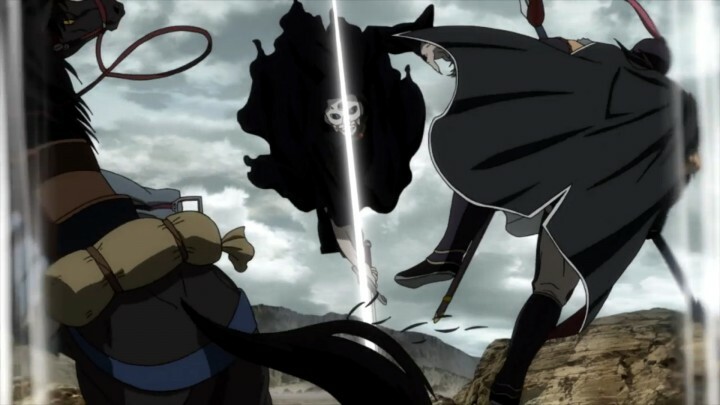 Taking an odd turn though, Arslan Senki starts throwing in magic and feats of superhuman strength. It’s a bit jarring at first, because up until this point the combat has been relatively grounded. Then suddenly there’s an assassin who can turn into a shadow, and a man who can lift tree trunks over his head. Daryun even stomps the ground so hard that it cracks, blasting himself forward with super speed. I suppose it does add more excitement to the action, but I was definitely hoping that it wouldn’t reach shounen anime levels of ridiculousness. 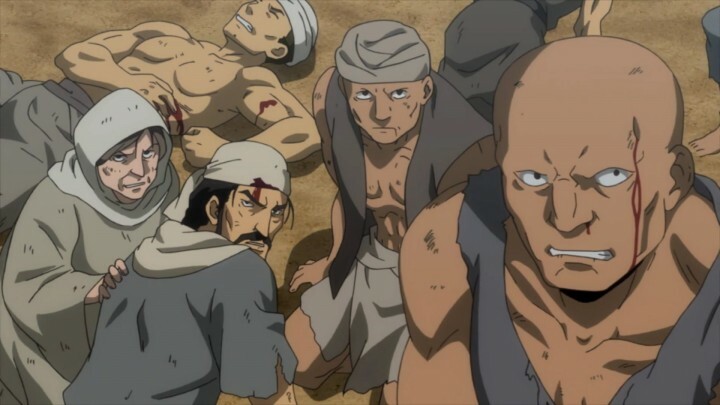 Here’s where Arslan Senki gets a bit bland, with a predictable story arc that feels like filler. Rajendra, the prince of the India-inspired country of Sindhura, decides to invade Pars. But of course, Narsus quickly defeats the enemy with another of his genius strategies. While he’s meant to be a mind without peer, sometimes it seems like everything goes too perfectly when he’s in command. At this point, there’s almost no tension in battles at all when they involve Narsus, as he practically guarantees victory without any miscalculations. A bit of uncertainty and challenge for Arslan would have helped make his battles more exciting. Sometimes everything goes too perfectly for Narsus. Eventually, Narsus manipulates Rajendra into making an alliance with them. Thus the group heads off to first help Rajendra ascend the Sindhuran throne before coming back to retake Pars with a larger army. Narsus’ crazy win streak continues without a hitch throughout this entire campaign, defeating overwhelming forces with ease. Even a horde of war elephants is easily dispatched by the Pars army under his guidance with minimal losses. I felt like I was just watching a series of predetermined events rather than a massive fight between two powers, and that got boring fast. To make matters worse, at the final end of this journey, Arslan doesn’t end up really gaining anything except for a shaky political truce; he just goes back to Pars with what he left with. Well, the group does add another new recruit, a Sindhuran spy named Jaswant, but he doesn’t have much of a background and seems kind of tacked on. At least the story starts to shift back to Pars, and I’m hoping that Silver Mask will provide a much more satisfying conflict than the Sindhurans did. Arslan Senki does a great job setting up the pivotal showdown between Arslan and Silver Mask. There’s a lot of anticipation for some exciting setpieces as both sides build up their forces. Silver Mask actually gains allies in Pars, rallying people with his fervent zeal and the experience of a capable leader. Arslan’s approach walks the path of compassion and the promise of a better country for all. Each leader attracts powerful companions and amasses a sizeable military force, ready to fight for each of their causes — some more selflessly than others. However, it’s a shame that the addition of more characters to the already large cast makes the lack of character development even worse of an issue. 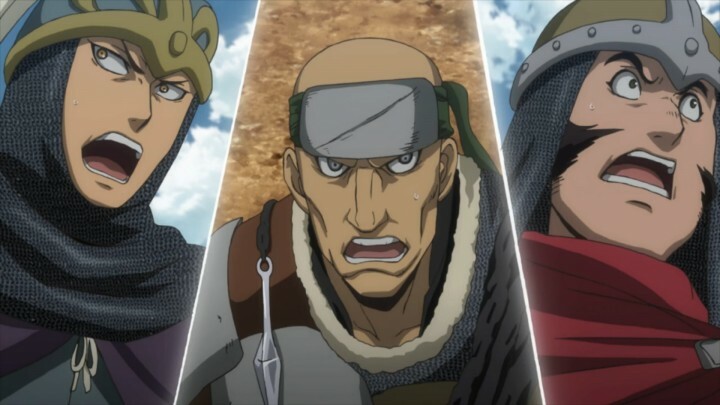 We already don’t know very much about Arslan’s closest allies, and introducing more names and faces makes it that much harder to grow attached to any of them. What’s worse, a key character leaves the group, and we never got so much as a flashback to learn more about this person’s motivations and aspirations. The final battle at least has better back and forth conflict between the two sides, in both the fighting and their beliefs. Not even Narsus could plan for every scenario, and he’s even caught off guard — a rare sight indeed. Ultimately, Narsus still succeeds in his strategy with a few strangely perfect coincidences and some plot armor, but that’s par for the course by now. Ultimately though, Arslan’s growth as a character is probably one of the highlights of the entire anime. 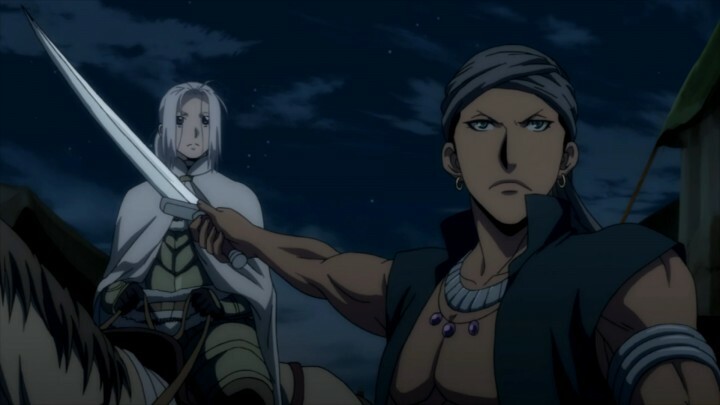 Arslan’s maturity is handled quite nicely, with a gradual pace throughout the season instead of giving him a sudden revelation that changes his entire persona. By the end, he evolves from a sheltered, weak-willed boy to a resolute and confident leader. He’s an idealist that understands the reality of what must be done, and doesn’t simply hide behind dreams or stubbornly charge forward. I found it really easy to root for him, all the way to the very end. 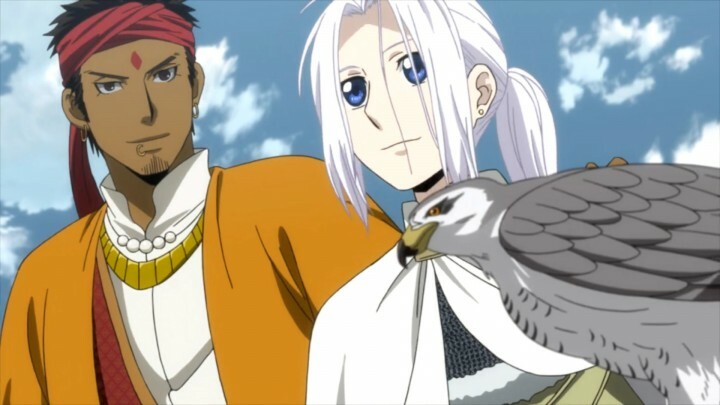 Overall, Arslan Senki‘s first season of the anime was decent entertainment with a few caveats. If you’re able to look past its inconsistent visuals, pacing, and characters, the story and scale of its events makes the anime one to keep up with — it’s easy to get pulled into the war torn world of Pars. And of course there’s Arslan himself who I believe really holds the show together. If only more characters were as well-written as him, Arslan Senki could have been a new classic among modern anime. For now, we can only hope that the adventures to come will provide more growth and perspective for Arslan Senki‘s cast and setting. Change is happening, and I can only expect the challenges to come to be even more massive and exciting — just maybe tone down the Narsus-factor a bit.